The Czech writer Michal Ajvaz visited Norway this week due to the recent Norwegian translation of his third novel ‘The Other City’. 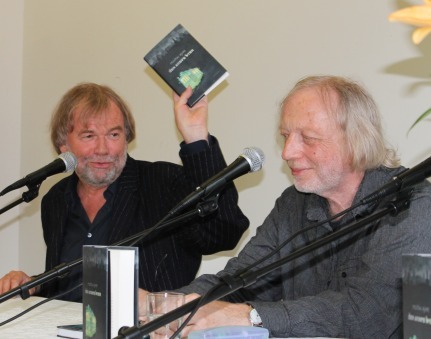 Bokvennen Forlag (Translated: The Bookfriend Publisher) initiated the translation and invited Mr. Ajvaz and the Norwegian author Jostein Gaarder to a conversation, led by translator Kristin Sofie Kilsti. Mr. Ajvaz debuted as a writer in 1989. In 1993, ‘The Other City’ was chosen the year’s best novel in the Czech Republic. Along with Gustav Meyrink and Karel Capek, Michal Ajvaz ranks as one of the most important Czech writers who explore surreal and magical-realistic worlds. He is often compared to Jorge Luis Borges. Mr. Ajvaz has won several prestigious awards, including the Jaroslav Seifert Prize in 2005. In 2009, Amazon voted the English edition of ‘The Other City’ as one of the best novels in the genre sci-fi and fantasy. Jostein Gaarder is known for his philosophical questions in his literature. Characteristic of his work is his curiosity and wonder of life’s meaning and life’s many enigmas. In 1995, his novel ‘Sophie’s World’ became the most-selling book in the world, and he has received numerous awards for his writing, including the Norwegian Critics Prize for Literature for his book ‘The Solitaire Mystery’. The topic of the conversation was the mysteries of inspiration and the origin of stories, where the two authors talked about their authorship seen in a magic-realist and philosophical light. After the conversation, the audience could ask questions to the authors. ThorNews wondered what the two authors think about being put into ‘literary boxes’, Mr. Gaarder as a philosophical writer and Mr. Ajvaz as a fantasy writer. ‘They put me in different boxes in various countries. In the Czech Republic I am a magic-realistic writer, in the US I am a sci-fi writer and in Poland I am a poet. That is not interesting for me’, Ajvaz answers. To the same question, Gaarder replies: My project [in life] is ‘humans’. Because I am a human, I think! Descartes said ‘Cognito ergo sum’. I would turn it the other way – Sum, ergo cognito. I do not accept the boxes. ThorNews asked Ajvaz a direct question: What happened in 1989? ‘I wrote surreal imaginative fiction for over 20 years only for myself. At that time, this type of writing was not allowed. 1989 for me personally was that I could publish my books. It was impossible to by books in bookshops, and no books were translated into Czech. That was a big change in 1989 when this became available. For myself as a writer, I continued writing within the same literary themes and genres’, Mr. Ajvaz replies. Bokvennen Publishing consists of three departments: Vidarforlaget is a philosophically oriented and scientific publishing house, which also publishes the journal Personae. Secondly, Bokvennen Publisher translates classical and contemporary literature and also publishes a literary magazine, Bokvennen. Transit is a public-oriented publisher, which releases children’s books, Norwegian fiction, and documentary and debate books.